Above: Hannah with her father and daughter. After Jay Chou (周杰倫) and Hannah Quinlivan (昆凌) got married and started their family, they were very busy balancing their entertainment careers and managing their clothing brand. 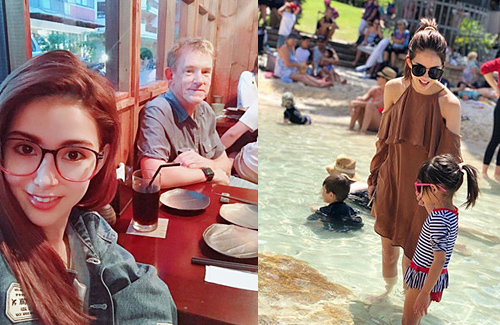 In trying to find time for each other during the holiday, the family took time to visit Hannah’s hometown in Australia, and treated fans to some vacation pictures. To end the vacation, the couple were seen sailing off in a boat to look at the sunset. In the photo, Hannah draped her arm over Jay’s shoulder. Netizens teased that Hannah is so manly and making them feel jealous.